Yesterday was a rough day. I had a headache most of the day that only got worse by the time I left work. I ran all of the scenarios that it could be, not enough water, not enough protein or this terrible pollen that the Washington, D.C. area has. There was another possibility that I did not think of until today. When your body goes through a detox, one of the side of effects could be what is a called a healing crisis. “This occurs when the cells release toxins into circulation but the elimination organs (skin, lungs, liver, kidneys, bladder & GI tract) are not able to eliminate them quickly enough. The toxins remain in circulation and can affect the brain stem region leading to nausea, poor coordination, headaches, fatigue, malaise, fever, etc.” In my case, it was the terrible pollen. My face hurt, my head ached, migraines begin and I cannot see. If untreated, I get an upset stomach and start vomiting. Well this is how I woke up this morning. Today I only drank green tea, water and had one smoothie this evening. Tomorrow should be better. Ok so before I begin, let me explain what a cleanse is and is not. I have had a LOT of questions (questions are good) and hopefully I can provide the answers. People always ask me why are you eating if you are doing a cleanse? Normally, I would do an herbal cleanse. My favorite cleanse is by Renew Life products. An herbal cleanse is a combination of herbs (depending on which ones you take) that cleanse the colon, kidneys, bladder, intestines and liver during a particular period of time. I generally do an herbal cleanse a few times a year. You can still eat when you do an herbal cleanse, hopefully you are eating better while doing it. A fruit cleanse or a smoothie cleanse is basically a cleanse togive your body a rest from the whole digestive process. “Digestion time varies between individuals and between men and women. After you eat, it takes about six to eight hours for food to pass through your stomach and small intestine.” That was by the Mayo Clinic. With juicing and doing smoothies, you don’t have the process of breaking down foods. While you can lose weight, these are not diets and should not be used for such. Now on to my Day 2…. Fyi, this is a very nice stock photo of a perfect green smoothie. MINE on the other hand, do not look like this. Mine are brown and scary looking!! I had a rough night. I went to bed with the WORST headache. I thought that my headache came from starting the smoothie cleanse and not having enough protein or water. As a vegetarian I have to be sure to get enough protein in my daily diet. I woke this morning, headache was gone. Got to work and headache was back. After hearing the complaints from my co-workers about allergies, I found my culprit. Me bringing up my headache was part of the reason why I did not prep the next day. In the book, there are two programs. One where you have three smoothies a day and the other where you have two smoothies and a full meal. I chose the second program as I would like to continue after I get through this. My intent was to get up at 4:50 a.m., work out, shower, dress, shine and I am out the door. Instead, I woke up at 4:00 a.m. having to pee SO bad. I didn’t look at the clock with the idea of go to the bathroom and then work out. That would be a smart and dedicated person. I laid there for a minute until I couldn’t take it anymore. I got up, went to the bathroom and got back in bed. Yep, I laid there until the alarm went off at 5:20 and THEN rolled out of the bed at 5:30. I intentionally did not prepare for my morning smoothie as I wanted to see how long it would take me to make it in the morning and how it would affect my morning routine. Most of my clients or students complain that making smoothies or juicing would take too much time out of their day. Actually, putting on my makeup takes the longest of my morning routine. I made my smoothie and got on with my day. Now keeping in mind that I downed my first smoothie at 6:00 a.m., I was ready for my first snack by the time I got to work. My snack of choice was an apple and a 100 calorie pack of almonds at around 9:30 a.m. I tried to hold out until noon to have lunch but I was fading fast and seeing stars. After lunch I had TWO, count them, two snacks before I had my next smoothie for the evening. All and all it was a good day I’d say. Tune in for Day 3. 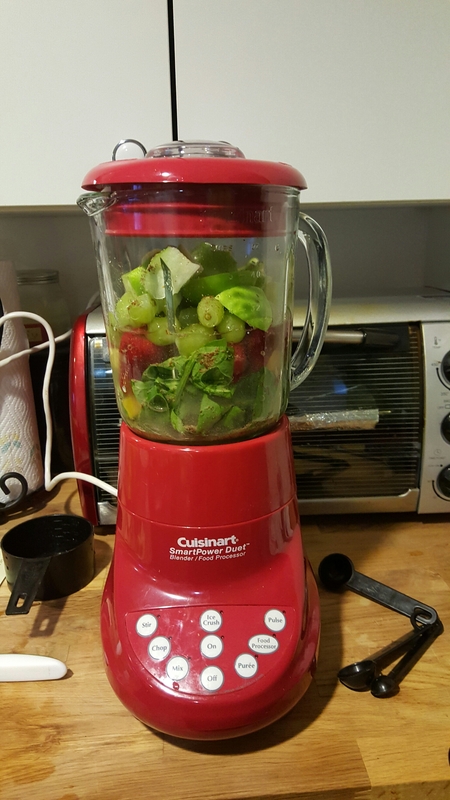 In the book 10-Day Green Smoothie Cleanse by J.J. Smith, she says that you have to mentally prepare for this process. That is the absolute truth. I have been getting my mental ready for about two weeks now. I was looking at several smoothie cleanses and this one chose me. Often times when I talk to clients or potential clients who say they want to be healthy, there’s always some hesitation with what needs to be done. Changing negative eating habits or beginning a workout routine requires preparation, organization and prioritization. So the first thing I had to do was workout a schedule for myself. It sounds weird to schedule eating but when you get busy, you can forget to eat or not eat at all, which is not good. In addition to the smoothies, you are to drink lots of water and have healthy snacks. I use my smartphone to schedule everything as I roll out of bed at 5:30 a.m. Since today is Sunday, this is how my first day went. So since today is Sunday, my day began differently than what it will look like tomorrow. I woke up fairly late. I did not prepare the night before so I had to go digging for everything. That is not going to work during the work week. Anyway, I pulled out the Magic Bullet and was quite confused. Let’s keep in mind, I have two blenders and two juicers. I teach a class on juicing and making smoothies so this should be easy but I have never used the bullet before and was quite confused. Once I figured it out, I realized that the measurements were larger than what the bullet was going to hold so I had to use one of my blenders. The smoothie started out looking normal until I added the flaxseed and the protein powder. Then it looked pretty scary. The taste was not bad and I felt great though. I washed clothes, cleaned up my smoothie making mess. I also take a multivitamin. My issue came when I had to make a Target run.I was trying to gauge my next smoothie and when I would need to eat my snack. I decided to eat the snack first and then go thinking that would hold me until I got home for my next smoothie. Well hunger escalated quickly. I was starving. I was beginning to get hangry. Everything in Target was calling my name. Those M&Ms, the chocolate cupcakes and cookies just would not go away. I resisted the temptations. I had to go to MOMs to get more protein powder so I got a little bit of walnut and almond granola to hold me over. I made it home safely to my smoothie and no one got hurt. Later for my snack I had some green tea, a 100 calorie almond pack and an apple. For dinner I had a nice healthy salad. Now time for yoga.